Keep your hands warm during cold weather with a pair of crocheted fingerless gloves. Fingerless gloves are also known as wrist warmers and arm warmers. This simple crochet accessory will provide warmth to your hands while allowing your fingers mobility to write, text and type without removing your gloves. These fingerless gloves are made with bulky weight yarn and are meant to be loose and slouchy on most adult female hands. This is an easy pattern than can be accomplished in an evening. Click on the pattern photo below to download the Adobe printable pattern. Change to a smaller hook size to create a tighter, more fitted glove. Two strands of worsted weight yarn can be substituted for bulky weight. Check your gauge to determine if the hook size needs to be changed. Stitch a ruffle around the wrist or the finger opening for a more feminine touch. No matter whether you prefer romantic, fancy or plain-Jane fingerless gloves, there are many free crochet pattern options from which to choose. Give one or all of these cozy warmers a try. The vintage-inspired arm warmers at Whistle and Ivy will have you dreaming of a different time. While both beautiful and romantic, these fingerless gloves also have the appeal of simplicity. This is a quick and easy project for a beginning crocheter. 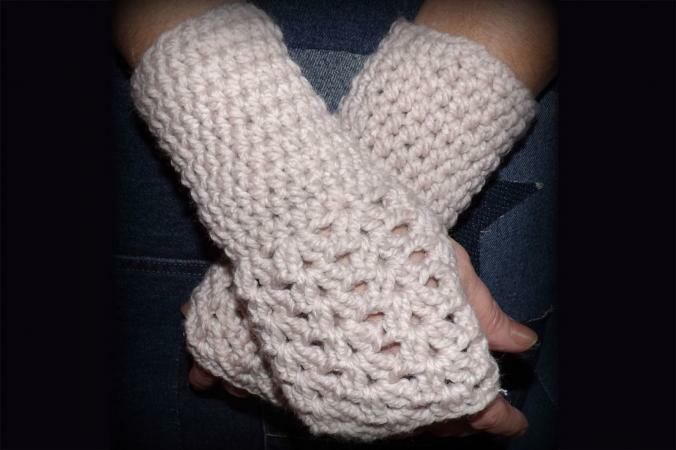 The crocheted wrist warmers at Quality Crochet 4 Fun have beautiful cables worked into the design. 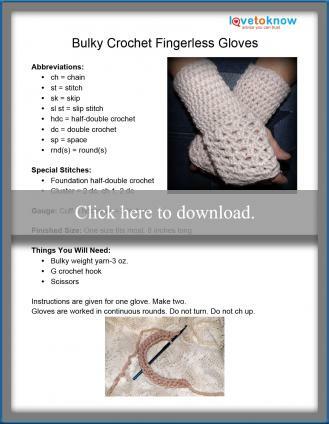 This is another quick project, but the pattern will require a crocheter to have at least intermediate skills. The fingerless glove pattern found on Moogly requires advanced crochet skills, but once the stitches and techniques are learned, a cute and stylish pair of wrist warmers can be completed very quickly. Crocheted accessories are quick projects and make excellent gifts for family and friends because most patterns are one-size-fits-most. They are also a great stash-buster for all your partially used skeins or new skeins you've purchased to sample. Try making a matching scarf and hat for your new fingerless gloves!